Dr. Julian Bailes, one of the doctors whose research on brain injuries in football challenged the NFL, tells CBS News he believes the sport is now "safer than it's ever been." Bailes worked with Dr. Bennet Omalu to expose the risk, and their story is told in the movie "Concussion," opening Christmas Day. 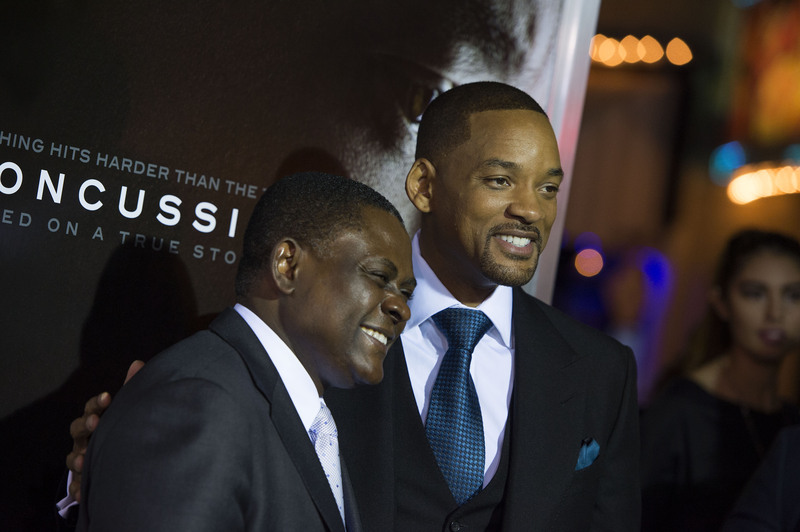 The film stars Will Smith as Dr. Omalu, a forensic pathologist who grew up in Nigeria and was working as a coroner in 2002 when the body of former Steelers star and Hall of Famer Mike Webster came onto his table for an autopsy. Omalu knew very little about football but had seen news reports of Webster's mental health decline and financial ruin over the past decade. As Omalu sought answers to the cause of Webster's death -- and potential reasons to explain his deranged behavior -- he found evidence in Webster's brain of an Alzheimer's-like disease called chronic traumatic encephalopathy, or CTE. "I was simply fulfilling a promise that I made to Mike Webster that ... I would get to the truth," Omalu told "CBS This Morning" in November. Omalu discovered a protein sludge, which was killing the cells associated with mood and emotion. He found an ally in Bailes, a former NFL doctor who is portrayed by Alec Baldwin in "Concussion." In an interview with CBS News, Bailes emphasized that it is the repeated, minor head trauma that occurs regularly in football that appears to lead to CTE, as opposed to the more violent hits that lead to concussions. "We believe that it is from those thousands of repetitive blows to the head, not necessarily from known or diagnosed concussions," Bailes said. "This causes a pretty characteristic picture of breakdown of the major skeleton protein in the brain called TAU. It's accumulation within brain cells, if severe enough, can lead to symptoms that are consistent with dementia." Bailes has been a neurological consultant to the NFL Players' Association (NFLPA) since 1994, and serves as medical director for Pop Warner Football, the largest youth sports association in the U.S.
Omalu thought the NFL would embrace his research, but instead he was met with much resistance. "They wanted to exterminate me professionally, to retract my paper, accusing me of fraud," he said. Eventually, the NFL did get on board with the growing body of scientific evidence, and the league has made substantial changes over the past several years to make the game safer for players. "The biggest thing is avoiding unnecessary hits to the head," Bailes said. "I think that's been done at every level of play starting from the NFL down to youth football. It entails avoiding unnecessary hits in practice. It involves enforcing rules that are already on the rule book about head-to-head hits and purposeful hits to the head. It's also about education and teaching the signs and symptoms of concussions to athletes and coaches." Despite new reports that have confirmed CTE in a quite a number of former NFL players after their deaths -- including Junior Seau and, most recently, Frank Gifford -- Bailes said that he believes the sport is "safer than it's ever been." "There's more recognition and attempts to prevent unnecessary or dangerous head impacts but it's still a contact sport that injuries can occur to the brain and other parts of the body, as well," he said. When asked about a recent study that found that 87 out of 91 former NFL players who had donated their brains to science after they died were confirmed to have CTE, Bailes said that he still believes the overall risk is small. "The researchers were given brains to analyze in people who had been exposed to repetitive head impact and people who were felt by their families to have had symptoms of dementia," he said. "That was a highly selective group so it doesn't really get at the true prevalence of this disease. How many people who were exposed previously, how many people who are exposed now may get it. I think it's the minority but we don't know that number." In an interview this week with Time, Omalu said he believes over 90 percent of professional American football players suffer at some degree from CTE. Earlier this month, in an Op-Ed piece in the New York Times, he argued that children should not be allowed to play football until the age of 18. "Our children are minors who have not reached the age of consent," Omalu wrote. "It is our moral duty as a society to protect the most vulnerable of us. The human brain becomes fully developed at about 18 to 25 years old. We should at least wait for our children to grow up, be provided with the information and education on the risk of play, and let them make their own decisions. No adult, not a parent or a coach, should be allowed to make this potentially life-altering decision for a child." In a teleconference the next day, Bailes said he disagreed with Omalu's stance. "I don't think he has any facts or experience or research in youth football to make that statement," Bailes said. "I think that football is safe as long as the players and their parents understand the risk and the pros and cons and the benefits and potential risk of participating. I think it's a personal decision ... I don't think the facts support that there are cases of CTE from youth football participation." As for the NFL, in a statement to "CBS This Morning" the league said it "has made numerous changes to the game to enhance player health and safety at all levels of football... These include nearly 40 rule changes in the last decade, strict concussion protocols, and better training sideline medical care." But many critics say the NFL has not done enough to protect their players. "I think it's great that they're making an effort but think about the basic physics of the brain," said Jeanne Marie Laskas, who wrote the book "Concussion," on which the movie is based. "We've known this since the 16th century. The brain sits in fluid. It hits the skull on impact. There is no buffer between the two. Woodpeckers have a buffer. Rams have a buffer. The human brain does not have one. So you can put a helmet on that's a foot thick, but with impact, the brain is going to hit the skull and that's the injury." For Laskas, the only solution is to "take the head out of the game." Those involved in the issue are hopeful that the release of the movie will bring greater awareness to CTE and its connection to repetitive head trauma. "I think people can get a better appreciation for how science emerges to overcome barriers and obstacles and what the process of accepting science can be," Bailes said. "And at the end of the day, that everyone from the NFL recognizes that the findings are real and that prevention of injury should be taken seriously." "Before CTE, retired football players were ridiculed and dismissed," Omalu said. "I think they're beginning to get the attention they need."